In the recent build conference, we had few Azure announcements. Yes out of that, “Azure App Service” is something important for dev’s to learn and try out. Had a chance to go through this announcements, so thought of sharing the awesomeness in this post. 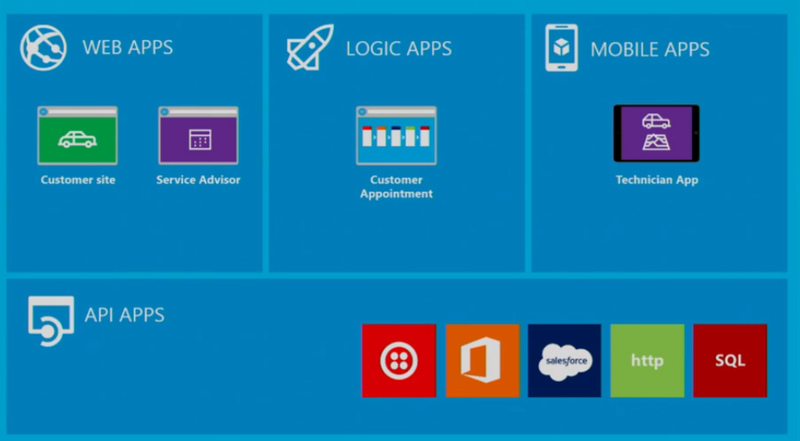 Azure App service has got 4 features – Web, Mobile, Logic and API as below. It actually enables us to to easily create Web(web sites) + Mobile + Logic + API Apps and also facilitate us to refer each of them without complex coding or integration pains. + straightforward web hosting multitenant platform(PaaS), you can build and host websites using .NET, Java, Node.js, PHP, and Python. there is nothing new here, except renamed from Azure WebSites if you are familiar with. + SSO, + build engaging iOS, Android and Windows apps. + you can easily integrate with facebook, Twitter, Google etc.